Hang casual clothes together (color coordinating optional). 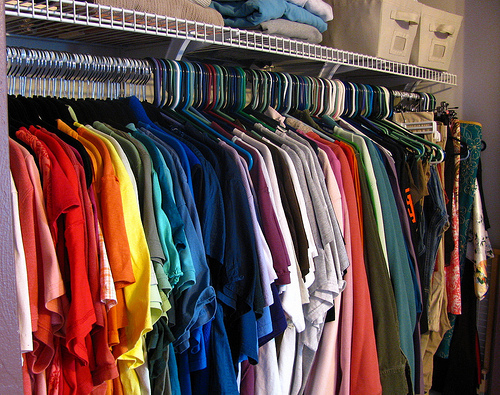 Odds are you probably have a million things you’d rather do instead of organizing your closet. Especially when you stand before the small cramped space wondering which belonging will land on your head when you open the door. Consider this a sign: It’s time to organize this tiny closet once and for all. Take these small closet organization tips, turn on some music and slip into something loose and comfortable - this may take some time, but it's best not to drag this task out. In order to maximize your space, you first need to make some editing decisions. Have you heard of the 80/20 notion? It basically shows that most people only wear 20% of their clothes 80% of the time. That means that 80% of your closet is crammed with items you don’t even wear. Curious to see if this applies to you? Set aside an entire afternoon to organize your closet. If you have little ones, choose a time when they’re away so you can work without distraction. The last thing you want is to get side tracked while the contents of your small closet are sprawled throughout the room. 5. Things to keep, but to find another storage space for. Take your time with this step and trust your instincts. Keep the items you wear frequently. If you haven’t worn something in the last year, ask yourself why you want to keep it. If it doesn’t fit, donate it. If you like it, but it’s no longer your style, donate it. If you’re holding onto it for sentimental reasons, put it in pile #5. Save your valuable space for the items you wear now. Take a look at pile #1. This should only contain clothing and clothing accessories that you wear daily. Boxes, coats, and any random objects that slipped into that pile need another storage home. These things are clutter seeds and they’ll only attract more clutter. If you don’t have an attic or basement, consider using bed raisers to increase storage space beneath your bed. Special occasion garments, like that expensive bride’s maid dress or sequined top you bought on sale for next New Year’s Eve, should really be kept in a separate space from your daily closet. Portable garment racks can be a great storage solution. Protect special clothing in garment bags and hang them on these racks in the basement or attic. If you don’t have either, try to keep the rack in an out-of-the-way corner concealed with a decorative curtain. Before you add your wardrobe essentials back to your small closet, take this rare opportunity to vacuum and clean the surface areas in your closet. If you have a top shelf, use the top shelf for clear storage containers and the floor for your shoes. If you don’t have a top shelf, divide the floor for both as needed. Clear containers are great for storing seasonal clothing out of the way, but not completely out of sight. Keep a practical number of sweaters and pullovers out for chilly summer nights, as well as tank tops and thin shirts for layering in the winter. Use the containers for items you positively won’t wear in the off-season. If you have the floor space, use a shoe rack to keep them in order. If not, use hanging shoe storage on the back of your closet door or in the corner of your closet. Add hooks to the lower half of your closet door for purses, or save a place for them on your top shelf. Use a belt hanger for belts and multi-pant hangers for pants. Wood hangers generally keep the shape of clothing better, plus they look nicer than plastic. With a small closet space, it helps to establish a simple sense of order that you know you can maintain. There’s no need to color coordinate, but you may want to group your casual clothing separate from professional clothes, hanging your bottoms on one side and tops on the other. Once your last item is hung, pack your trash and donation piles into separate bags and send them on their way. Organizing a closet - especially a small closet - may be physically exhausting, but you’ll feel energized by the results. Guaranteed!